Smarter Balanced Content Development Opportunities This Summer! l Currently certified or licensed to teach English language arts/literacy (ELA) and/or mathematics in a K–12 public school or certified to teach English learners and/or students with disabilities. Currently teaching in a public school or currently employed by a public school, district, or state education entity, including higher education, located within a Smarter Balanced member state. Have taught ELA and/or mathematics in grades three through eight and/or high school or worked in a classroom content support role, such as a literacy or mathematics coach or district/state content specialist. Have taught students with disabilities and/or English learners in grades three through eight and/or high school or worked in a support role, such as a district/school coordinator or instructional specialist. Educators with specialization in teaching students with visual impairments or who are deaf or hard of hearing are encouraged to apply. Familiarity with part or all of the Common Core State Standards for the content area in which they are interested in working. For ELA item review, educators who have documented expertise in the area of science and/or social science may apply. Some opportunities will have additional preferred experience qualifications. Apply by e-mailing Dixie Abbott, California Educator Involvement Coordinator, , to request an application. Completed applications must be returned by May 20, 2016. An FAQ document can be requested by e-mail as well. Smarter Balanced and respective contractors will make the final selection of educators to serve from each member state. The goal of that selection will be to have a balance of geographic regions, grade levels, years of experience, and other demographic data. Lodging, travel costs, and applicable reimbursements to each selected participant will be provided following the meeting and may include substitute reimbursement defined by local policy. The video “Understanding the CAASPP Student Score Report 2015–16,” which explains how to interpret student results and highlights the new features found in the report, is now available in English. It is located on the California Department of Education (CDE) CAASPP Student Score Report Information Web page. The Spanish version of the video is coming soon. Each document will be available soon in Spanish and other languages. In addition, the CAASPP Student Score Report documents for the Standards-based Tests in Spanish for grades two through eleven (reading/language arts) will be available shortly. Reminder: As of last week, the CDE samples of the 2015–16 Student Score Report are available in Spanish on the CAASPP Student Score Report Information Web page. 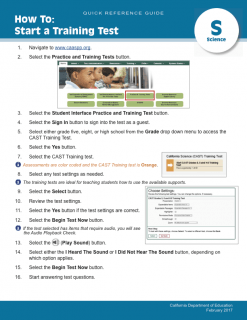 Part 1, Embedded Resources lists the universal tools, designated supports, and accommodations delivered digitally (e.g., highlighter, text-to-speech, American Sign Language videos) that may be used by a student having appropriate documentation to receive a valid test score for the designated test(s). Part 2, Non-embedded Resources lists the universal tools, designated supports, and accommodations delivered locally by school staff (e.g., separate setting, abacus) that may be used by a student having appropriate documentation to receive a valid test score for the designated test(s). Part 3, Instructional Supports and Resources on the California Alternate Assessments (CAAs)provides information on the resources available to students taking the CAAs. Part 4, Unlisted Resources provides information on unlisted resources, what they are, and how they can be requested. Unlisted resources are defined as accessibility supports, documented through an individualized education program or Section 504 plan, that are not listed in Parts 1, 2, or 3 of Matrix One. Therefore, a local educational agency (LEA) must submit a request through the Test Operations Management System, specifying what kind of access the unlisted resource will provide and why it is needed. Page 9 of Matrix One displays the list of identified non-embedded unlisted resources that change the construct being measured. Remember, not all unlisted resources result in invalid scores; that determination is made by the CDE during its review of the unlisted resource request. The Smarter Balanced Usability, Accessibility, and Accommodations Guidelines document (PDF) is recommended as a reference for detailed information on the recommendations for use of the universal tools, designated supports, and accommodations listed in Matrix One. Further questions about the use of any accessibility resources should be directed to the CDE CAASPP Office at 916-445-8765 or by e-mail to . Technical questions regarding the operation of any of the resources, including the setting of print on demand, should be directed to the California Technical Assistance Center (CalTAC) by phone at 800-955-2954 or by e-mail at . Two options are available for the Manner of Administration setting: “Nonstandardized” (the default setting) and “Standardized/Benchmark.” Interim assessments administered in 2015–16 in a nonstandardized manner will be purged from the Interim Assessment Reporting System at the beginning of the 2016–17 school year. At that time, all 2014–15 interim assessment results also will be purged. The status of the Manner of Administration setting can be located in the Interim Assessment Reporting System, which displays an icon adjacent to the performance level to indicate that an assessment was administered in a standardized manner. The following sample screen shot shows how the icon is displayed. Recommended option—The test administrator sets it in the Test Administrator Interface before approving a student to begin an interim assessment. Specific instructions and screenshots are provided on page 30 of the Interim Assessment User Guide (PDF). Set it by using a downloadable data file from the Interim Assessment Reporting System after the test administration. This option requires the LEA CAASPP coordinator to work with CalTAC to re-upload the file and requires additional time for completion. Specific instructions are provided on pages 41–43 of theInterim Assessment User Guide (PDF) . Questions regarding the Manner of Administration setting should be directed to the CalTAC Digital Library and Interim Assessments Help Desk by phone at 855-631-1510 or by e-mail at . The CDE has authorized the Human Resources Research Organization (HumRRO), as the CAASPP independent evaluator, to conduct a study to investigate local experiences with the Smarter Balanced Interim Assessments. This study is an exploration of the usage of, experiences with, and utility of the interim assessments while also serving as an opportunity to identify areas for improvement. It is expected to provide insight as to the benefits and challenges of the Smarter Balanced Interim Assessments, their future improvement, and the enhancement of their ability to serve as a valuable resource for student learning. Today, HumRRO will begin surveying a random sample of CAASPP school site coordinators and test administrators. To those selected for the survey: We encourage you to respond, even if you have not completed any interim testing, and thank you in advance for your responses. Recommended option—The test administrator sets it in the Test Administrator Interface before approving a student to begin an interim assessment. Specific instructions and screenshots are provided on page 30 of the Interim Assessment User Guide (PDF) .